The school has partnered with PCC to offer introductory machine engineering curriculum. As students at Forest Grove High School began to wrap up the school year, eager to get to summer break, many chose to spend some extra time in the classroom after school. 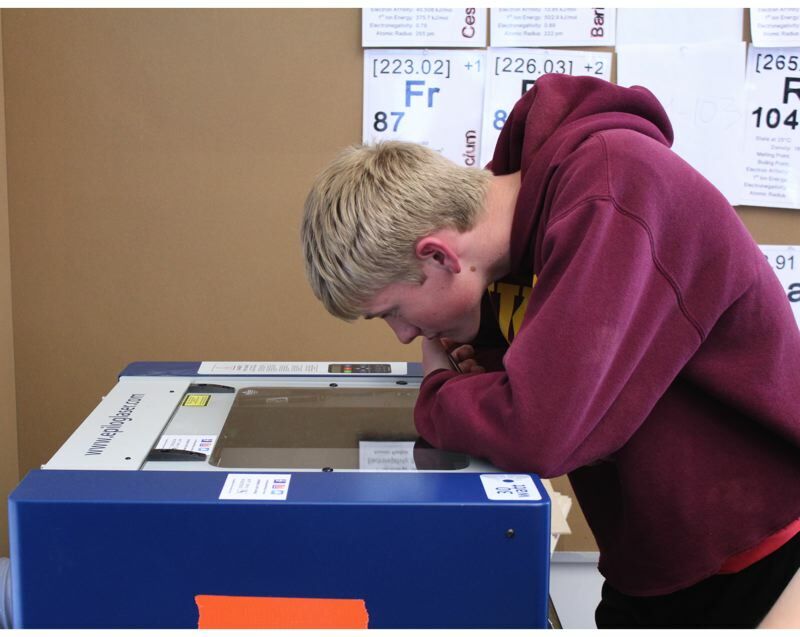 Forest Grove science and engineering teacher John Worst had an Epilog Laser in his classroom for student use for the last few weeks of school, thanks to a partnership between the high school, Portland Community College and Intel. Students got the opportunity to participate in STEM (science, technology, engineering and mathematics) workshops and later create designs on computers, using the high-tech laser equipment to engrave, cut and mark materials like phone cases, name tags and keychains. "Students love it," Worst said. "This is a Wednesday afternoon, there is no after-school bus today, and there are people in here working on stuff." And Worst loved it too. Borrowing the tech equipment is all tied to a new pathway program that will be offered at the high school in the fall: mechatronics, the combination of electrical engineering, mechanical engineering and computer engineering — or the engineering of machines — and Worst will be the lead teacher of the program. The mechatronics program was created in an effort to get more students interested in careers with a high demand in the local area, Worst said, and will serve as a direct introduction to Portland Community College's microelectronics program, showing students their local options. PCC offers a microelectronics program, which students can complete in just two years, graduating with an associate's degree of applied science and can then go on to pursue careers at surrounding tech companies, like Intel. 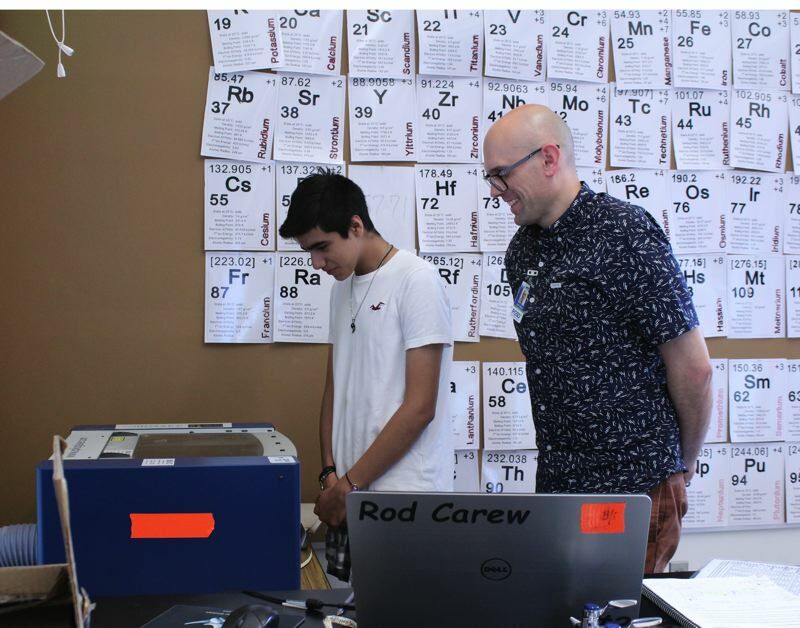 The Epilog Laser provided to students at Forest Grove High School belongs to PCC, but PCC microelectronics professor Dorina Cornea-Hasegan said it was purchased with grants from Intel, which is also working toward the same mission of getting local students interested in the STEM field. Last year, local tech companies came to PCC to hire 300 high-tech technicians, but there were only 20 graduates in the microelectronics program, Worst said, proving the demand is there. After the high school's career technical education (CTE) teachers were recently encouraged to apply for a state grant, they came up with the idea of starting a mechatronics program at the high school in partnership with the microelectronics program at PCC, and they were later awarded the $434,000 grant to start the program, Worst said. The pathway program will give students a strong introduction to what they could expect in the PCC microelectronics program, and it will equip them properly should they choose to pursue it after graduation. The program also shows high school students that there are alternatives to four-year colleges, Worst said. "Career technical education in general, I think it exposes kids to career paths that maybe we haven't emphasized or advertised in the past," Worst said. "Generally, it's been like four-year college, four-year college, four-year college, but PCC's industrial partners, they would prefer that their engineers were technicians first, and this program is specifically designed for educating a technician." The pathway program will have four semester-long classes and the potential for an internship at a local tech company before pursuing a job in the field, Worst said. Also, the Oregon Promise — a state grant that helps cover the tuition of students attending community college in Oregon — gives students from all backgrounds a good chance of having those two years of secondary education paid for, he said. "I think by exposing them to cool things that are fun and useful, (where) you can make a lot of money, and there's a lot of demand locally, creates a very clear vision and clear path, and so it's like advising on life," Worst said. The new partnership between Forest Grove High School and PCC works well for both parties, as Cornea-Hasegan said the college has been interested in working with high school students for a while. "The goal that we have here in the microelectronics technology program (at PCC), is to have strong and solid and long-lasting partnerships with the high schools in Washington County," she said. "And to offer them all kinds of (STEM) workshops either here on campus or sometimes on site in the high school." Cornea-Hasegan agreed local tech companies like Intel have a much greater demand for technicians than there is supply in Washington County. "By doing this, we are trying to inspire (high school students) to come to PCC to get enrolled in microelectronics and eventually start working in the clean room at some of these semiconductor industries around us in Washington County," she said. "These jobs are extremely rewarding, not only from the financial point of view, but as an intellectual challenge. … And these usually are long-lasting careers. We can always, always have and absorb more students — we never produce enough graduates (from the program)." While the engagement with high school students begins with Intel funding the equipment and lessons for PCC to provide, the process typically ends with the company as well, Cornea-Hasegan said. "At the end, Intel is again present to come and interview and hire all of the successful candidates from the pool of (microelectronics) graduates of each year," she said. With an average starting salary of $55,000 for a high-tech technician, both Cornea-Hasegan and Worst agree that there are many appealing and awarding elements of the career, and that all it takes is introducing students to the field from an earlier age. With almost 320 students signed up for the pathway in the fall, Worst said he is confident it is one that will be a success for all.